From small tempos to big containers, all vehicles that were carrying goods had reflectors stuck on them. The traffic department stuck over 1,000 reflectors on goods carriers during the ongoing road safety week campaign. ‘‘Reflectors are necessary as it will help the driver riding behind to know that there are goods being carried in front of him. So, we made sure to stick red and yellow reflectors on the rear side of vehicles carrying goods. These reflectors last for over three months. 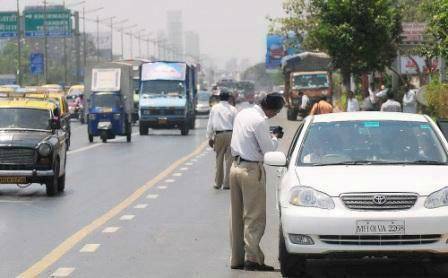 We even made sure not to use white reflectors as they get worn out soon,’’ said inspector (traffic) Shrikant Sonde. Meanwhile, the traffic cops had held a number of activities and programmes for residents during the road safety week. ‘‘Programmes were held for different modes of transport. The things that can be explained to car drivers cannot be explained to auto or truck drivers. So, we organised separate bike rallies for men and women, felicitation programme for auto drivers and activity-based programmes like drawing, elocution and essay competition for school children,’’ said DCP (Traffic) Sandeep Palave. As many as 200 auto drivers, including women drivers, were felicitated by the traffic department for doing good work during the year. Over 800 men and women motorists who had taken part in the bike rally were given a kit of reflecting jackets, caps and whistles. “These people would be called as ‘traffic friend’ and they would be able to wear the jacket and cap and solve traffic congestion, if any,” added Palave.